Dutch troops to Mali war? 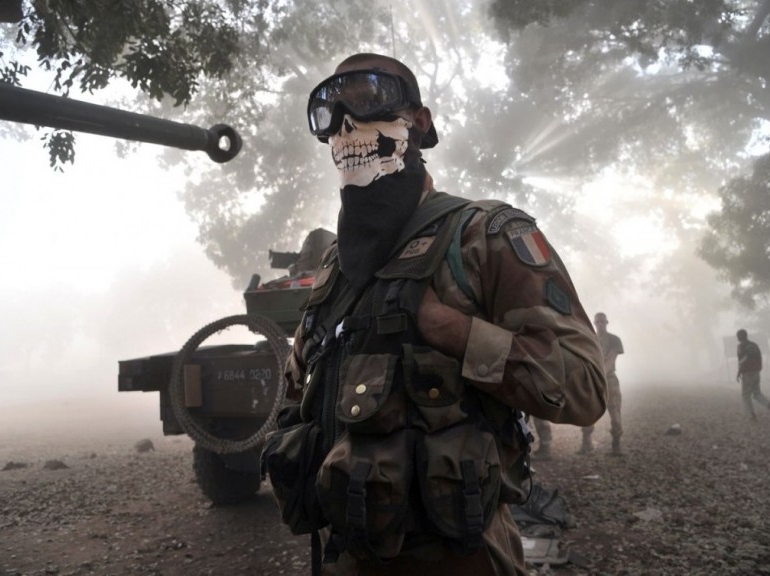 This photo of a French Foreign Legion soldier, part of the invasion of Mali, shows the real face of that war. That war is not “against Al Qaeda terrorism” (supported by the French government in Libya, and still in Syria). It is not for women’s rights, human rights or secularism. It is in support of a military dictatorship. It brings death, mainly to Malian civilians. This war is a neo-colonial war. The French Foreign Legion became infamous in the nineteenth century for its atrocities while imposing colonial rule in Algeria and elsewhere. Now, it plays a role in twenty-first century neo-colonialism as well. While the Dutch government are preaching “austerity” to their citizens, they are planning to spend lots of money on neo-colonial war in Mali. The idea is to send from 300 to 400 soldiers. These include the elite units of commandos and marines. they should gather intelligence in northern Mali, using four Apache helicopters. Army and police instructors should go to train the Malian army and police. Within weeks, the government will decide on the details of the contribution. This entry was posted in Economic, social, trade union, etc., Human rights, Peace and war and tagged Mali, Netherlands by petrel41. Bookmark the permalink.